A diary of my 10,000-mile train journey from York to Hong Kong, via Moscow, the Trans-Siberian Railway, Mongolia and China, in 1997. This article describes my second journey on the Trans-Siberian railway. My first journey was made in 1988, when I travelled from England via the Dover - Oostende ferry, then by train to Moscow, Beijing, Guangzhou and Hong Kong. On that occasion I used the 'Trans-Manchurian' route between Moscow and Beijing, which runs further east on the Trans-Siberian main line before branching off to the south and continuing through Harbin and Shenyang. In early 1997, myself and a group of friends began planning this journey from England to Hong Kong. 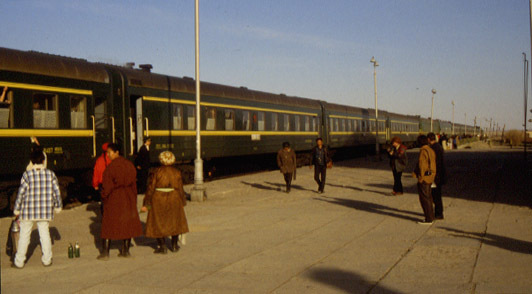 We initially considered using the new rail route from Kazakstan into China, but opted instead for the 'Trans-Mongolian' route, which was easier to organise. This follows the Trans-Siberian main line as far as Ulan Ude, before heading south to cross Mongolia. Now that the Channel Tunnel was open we could make the entire journey by train, and we planned to visit a number of places in China rather than travelling directly to Hong Kong. We managed to get eight people interested (a useful number for filling two 4-berth compartments on most trains) and hotels, trains from Moscow to Hong Kong and a number of sightseeing excursions were booked in advance through China Travel Service in London.